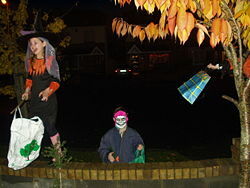 A Halloween scene in Dublin, Ireland. Can people make Halloween harmless? When it comes to Halloween—or any other holiday for that matter—you should ask yourself, “Did God make man in His image, or did God intend man to remake God in man’s image?” Now that’s a sobering thought. The religious excuse for perpetuating Halloween might be that, as we’ve seen, church leaders long ago called it a “holy evening” for all the Catholic saints who had no day assigned to them. But face it: People who celebrate this evening today couldn’t care less about such religious notions. All they think about is instant gratification, to follow the pack with everyone else and to have some fun. The Encyclopedia of Religion goes on to say: “Modern Halloween activities have centered on mischief making and masquerading in costumes, often resembling otherworldly characters. Folk customs, now treated as games [such as bobbing for apples], have continued from the various divination practices of the ancient celebrants of this occasion. Supernatural figures [such as the ghost, the witch, the vampire, the devil] play a key role in supplying an aura of the mysterious to the evening, whether or not they originally had an association with the festival. “Children are particularly susceptible to the imagery of Halloween, as can be seen in their fascination with the demonic likeness of a carved and illuminated pumpkin, known as the jack-o’-lantern. In recent times, children have taken up the practice of dressing in Halloween costumes and visiting homes in search of edible and monetary treats, lightly threatening to play a trick on the owner if a treat is not produced” (p. 177). The fact is that Halloween is NOT harmless. It leads people away from God’s plan as revealed in the Holy Days and blends paganism with a semblance of religion. It obscures the real hope of salvation. Jesus did not keep it or endorse anything like it. It should not be kept by real Christians. Hope of Salvation: How the Living Church of God differ from most Protestants How the Living Church of God differs from mainstream/traditional Protestants, is perhaps the question I am asked most by those without a Church of God background. Posted in COG News, Doctrine | Comments Off on UCG: Halloween Harmless? 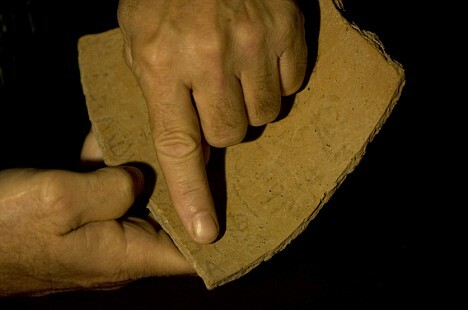 Proof: Yossi Garfinkel displays the ceramic shard bearing a Hebrew inscription that may be evidence King David slew Goliath. Astounding new evidence has been unearthed in Israel that could confirm the biblical story of King David. Until now, almost nothing has been found that would prove the biblical account of a shepherd boy from the 10th century BC who slew the giant Goliath and went on to become the King of Israel who founded Jerusalem. But today Hebrew University archaeology professor Yosef Garfinkel announced the discovery of a tiny, but potentially invaluable, piece of pottery at the site of the ruins of an ancient fortified city south-west of Jerusalem dated to the time of King David. Garfinkel said that it carried the earliest-known Hebrew inscription, some 850 years earlier than the Dead Sea Scrolls. Scholars are still trying to decipher the full text of the inscription, but Garfinkel said they are excited at the prospect of a link to David because they have already translated the words for “king,” “judge,” and “slave” , which he said suggested it was some sort of official note from the time of his reign. Until now, scholars have been unable to say whether King David was indeed the heroic, psalm-composing monarch depicted in the Bible or the local and unimportant leader of a small tribe. Only one biblical-era inscription with the words “House of David” has ever been discovered, leading some scholars to question whether King David existed at all. Detailed excavations began only earlier this year. The fortress would have controlled the ancient trading route from Jerusalem to the coast and overlooks the plain where David engaged in his legendary mortal combat with Goliath, giant champion of the rival Philistines. Goliath’s home town of Gath was unearthed just a few miles away to the south. “The chronology and geography of Elah Fortress create a unique meeting point between the history, historiography and origins of the early Davidic Kingdom,” said Garfinkel. Garfinkel said the sophistication and size of the city suggested it was part of a strong, centrally-planned kingdom. It has been a busy week for archaeologists searching for King David and his family. In Jerusalem, a researcher said she had found an ancient water drain mentioned in the Bible as the route used by David’s forces to capture the city from the Jebusites. In Jordan, scholars said they had uncovered an ancient copper excavation site that tests showed could be the legendary King Solomon’s Mines (see also Solomon’s Mine Possibly Found). While we in the Living Church of God do not need additional proof, it is always nice when archeologists provide additional support for the biblical accounts–especially since many to dismiss the Bible have indicated that its stories (such as the one that David slew Goliath) were myths and not based upon reality. Hopefully those who have discounted the accuracy of the Bible will re-examine their positions and take the Bible as seriously as it should be taken. This is just one more example as to why one should believe the Bible–over time, properly understood archaeological evidence always will support the biblical account. Perhaps I should mention that I do believe that more artifacts will be found to support various aspects of the Bible. And while this is good, I also suspect that the coming Beast power will try to exploit this to his advantage to persuade those who had little previous interest in religion to support him. The Bible: Fact or Fiction? This is a booklet written by Douglas Winnail that answers if the Bible is just a collection of myths and legends or the inspired word of God. Read the Bible Christians should read the Bible. This article gives some rationale for regular bible reading. What is the Appropriate Form of Biblical Interpretation? Should the Bible be literally understood? What do the writings of the Bible, Origen, Herbert W. Armstrong, and Augustine show? Bible and Historical Resources on the Internet Electronic bibles, Two Babylons, early Christian literature, photos, and even links to old Herbert W. Armstrong materials. A Short Article on Faith A subject that could fill many books. Why Be Concerned About False and Heretical Leaders? There have been many false leaders–here is some of why you should be concerned about them. SDA/LCG Differences: Two Horned Beast of Revelation and 666 The Living Church of God is NOT part of the Seventh-day Adventists. This article explains two prophetic differences, the trinity, differences in approaching doctrine, including Ellen White. Posted in Old Testament History | Comments Off on Proof David Slew Goliath? One of the most plausible theories on the origin of Halloween is that the ancient Celts held an annual harvest celebration to mark the end of summer, usually a spirit-centered event. However, people from many religious and cultural backgrounds come together to celebrate Halloween and the fall season, whether traditional or alternative. “People indigenous to the isle of Great Britain, people of Irish descent, viewed Halloween as a time diminishing the void between the spirit world and real world,” said Cien Conner, president of the Alliance for Understanding Religious Alternatives. On that holiday, known then as “Samhain,” it was believed that the dead were able to mingle with the living and that ghosts and other supernatural beings walked the earth. Ryan Hayden, senior pastor of University Christian Church, offered his additional historical insight. However, some religions, like Islam, do not prefer its members to celebrate Halloween at all. “It is not [forbidden], but it is not encouraged,” said Ibrahim Saleh, treasurer of the Islamic Center of Manhattan. “Our prophet Mohammed emphasized that we should only celebrate our religious holidays. It is better to avoid it. Other traditional Halloween events like trick-or-treating are rooted in historical customs. For example, during “Samhain,” early Christians would go from village to village begging for “soul cakes” made out of square pieces of bread. It was believed in this practice — called “souling” — that the more cakes you gave, the more prayers would be said for dead relatives, expediting their ascent into heaven. Irish children would also carve potatoes and light them up, in commemoration of Jack, an Irish villain so wicked neither the devil nor God wanted him. The word Halloween, however, comes from the Catholic Church. Perhaps I should add that when I attended Catholic school, no one suggested that we dress up as “saints”. This seems to be a more recent, more “politically correct”, spin on this pagan holiday. Halloween is one more pagan holiday that allows critics of Christianity to point out the false practices that many who profess it adhere to. It was adopted as an inappropriate compromise to attract members by Greco-Roman supporters–it is clearly not a biblical holy day. Real Christians do not celebrate Halloween. Do you? 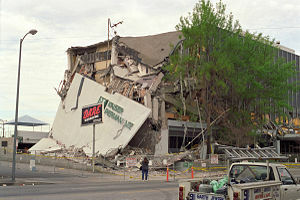 6.7 Earthquake in Northridge California Destroyed the Above Building of Kaiser Permanente As Well as Various Freeway Overpasses and other Buildings on January 17, 1994. WAM, Pakistan (Reuters) – About 175 people were killed when a powerful earthquake hit the southwestern Pakistani province of Baluchistan on Wednesday, flattening about 1,500 mud-walled homes and triggering landslides, officials said. The epicenter of Wednesday’s quake was in Ziarat district, a scenic valley and one of the main tourist spots in Baluchistan. Chief district administrator Dilawar Khan said 170 people had been killed in that district and 350 injured. “The rescue operation is over. We’ve retrieved all bodies and the injured. Now the problem is relief as there’s a shortage of tents, blankets and food while the weather is getting cold,” Khan told Reuters. The U.S. Geological Survey said the 6.4 magnitude quake struck 60 km (40 miles) northeast of the provincial capital, Quetta. Pakistan’s Meteorological Department put the magnitude at 6.5 and said the quake, at the shallow depth of about 10 km (six miles), struck at 5.10 a.m. (2310 GMT on Tuesday). About 20 aftershocks, the biggest of 6.2 magnitude, caused more damage and rattled the nerves of survivors as they scoured the rubble for loved ones. Hopefully, the aftershocks are now over. Asia in Prophecy What is Ahead for China? Is it a “King of the East”? What will happen to nearly all the Chinese, Russians, and others of Asia? India/Pakistan/Bangladesh/Sri Lanka: Any Witness? The Bible discusses the origins of those of Indian heritage and this article discusses some of the witness to them. Why Prophecy? Because the World Will Not End Next Week Some question or downplay the role of prophecy. This article gives some of the biblical reasons what it is important and explains why the world cannot end for at least 3 1/3 years from now. The world is focused on the American elections. But there are even more important elections coming on Sept. 28, 2009. Those will occur in Germany. And because a crisis is simmering there right now, this momentous event could come to a head even sooner than we think. This man is prophesied in your Bible! Daniel 8 speaks of a fierce German ruler to come “in the latter time.” Verse 23 describes him as a “king of fierce countenance, and understanding dark sentences.” “And through his policy also he shall cause craft to prosper in his hand; and he shall magnify himself in his heart, and by peace shall destroy many …” (verse 25). This king comes acting like he wants peace, but he is lying! He will be a ruthless and violent man—preaching peace but practicing war! Daniel 11:21 says this end-time Antiochus will “come in peaceably, and obtain the kingdom by flatteries,” yet will be a vile person. Verse 25 shows he will war against the king of the south with a great army. I believe we might see the Daniel 8:23 man within this year! This is Germany and Europe’s moment! And while it is remotely possible that whoever becomes the Chancellor of Germany in 2009 will ultimately become the prophesied King of the North, that individual cannot actually have that title in 2009. The Bible (in Daniel 9:26-27) refers to the one who becomes the King of the North, first as a prince who makes a peace treaty–a treaty that has not yet been made and that will last for about 3 1/2 years before it is broken. So even if Gerald Flurry’s hedged prediction identifies the one who ultimately could be the King of the North, it simply is not possible for that person to hold that title in 2009. We have seen the king of the south, radical Islam, come together and begin to push. But that statement is simply is not true. There is no King of the South yet. Nor (as Gerald Flurry has written and insisted elsewhere) can it be Iran. Gerald Flurry is another self-appointed false prophet. But one who is putting out over 278,000 magazines per issue. Hence one that some sadly pay attention to. Brother Martin, a stout man, was sitting on the toilet in the Wittenberg Monastery, wearing the black robe of the Augustinian Order, when he was suddenly struck with the fundamental concept of his reformist body of thought. All of this snooping around in the refuse of the founder of their church has not exactly been met with enthusiasm within Germany’s protestant congregations. In their view, the notion that the Luther family tossed dead cats into the household garbage is just as irrelevant, from a religious standpoint, as the suspicion that Luther, as a monk, attached his theses to the castle church with tacks instead of nails. But the debris from Luther’s household should not be downplayed. Some of it, analyzed using the methods of criminology, relates to the reformer’s intellectual works, and it even reveals that he was not always entirely truthful. But this is far from the truth. Luther’s father already owned a copper mill as a young man, while his mother came from a bourgeois family in Eisenach and had good connections to the royal mine administration. In 1484, when Martin Luther was still an infant, the family moved to Mansfeld, where the father quickly became a successful foreman. He operated three copper smelters, owned 80 hectares (198 acres) of land and lent his money for interest. The size and grandeur of his house, as the excavation revealed, were in keeping with his economic standing. “The front of the house on the street side was 25 meters (82 feet) wide,” says archeologist Björn Schlenker. The excavation exposed massive basement vaults and a rear courtyard surrounded by large outbuildings. It was on this farm that young Martin and his siblings played, surrounded by flocks of geese and chickens. The fragments at the site reveal that they played with crossbows, clay marbles and bowling pins made of beef bones — toys not every family could afford at the time. 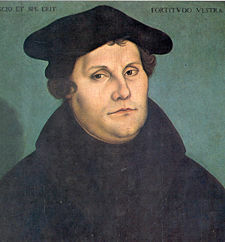 It is well known that Luther’s parents firmly believed in witches and the devil, but now further details have emerged. The remains of a pilgrim’s horn, a noisemaker pilgrims could buy in the western city of Aachen, were found in the rubble. The father had apparently traveled to Aachen, the German version of Lourdes, to marvel at the swaddling clothes and loincloth of Jesus. The young Luther did not yet find such relics repulsive when he studied law in Erfurt, a city in eastern Germany. But then suddenly he discontinued his university studies and fled into a monastery. Why? But the tale of a sign from above coming to Luther in the form of a lightning strike is greatly exaggerated. In truth Luther, who was 21 at the time, was fleeing from an impending forced marriage. “Newly discovered archive records show that the father had already married off three of his daughters and one son to the children of wealthy foremen,” explains expert Schlenker. Apparently it was now Martin’s turn. He also suffered from angina pectoris, which made him anxious. As gout set in, writing became increasingly difficult. And then there was his obesity. At first, the doctor weighed 100, then 120 and, finally, an estimated 150 kilograms (the estimate is based on an ink drawing made of Luther shortly after his death). The archeologists also found dozens of small containers, which Luther used to hold the many ointments and medications he bought for himself. Sadly Martin Luther’s penchant for not holding to the truth led to his own doctrinal compromises and a distancing from true biblical doctrines among his followers. Sola Scriptura or Prima Luther? What Did Martin Luther Really Believe About the Bible? Though he is known for his public sola Scriptura teaching, did Martin Luther’s writings about the Bible suggest he felt that prima Luther was his ultimate authority? Statements from him changing and/or discounting 18 books of the Bible are included. Do you really want to know the truth? Lies Where did they originate? What was really the first lie? What happens for lies? The Similarities and Dissimilarities between Martin Luther and Herbert W. ArmstrongThis article clearly shows some of the doctrinal differences between in the two. At this time of doctrinal variety and a tendency by many to accept certain aspects of Protestantism, the article should help clarify why the Living Church of God is NOT Protestant. Do you really know what the Protestant Reformer Martin Luther taught and should you follow his doctrinal example? Universal Offer of Salvation: There Are Hundreds of Verses in the Bible Supporting the Doctrine of True Apocatastasis Do you believe what the Bible actually teaches on this? Will all good things be restored? Does God’s plan of salvation take rebellion and spiritual blindness into account? Did The Early Church Teach Millenarianism? Was the millennium (sometimes called chiliasm) taught by early Christians? Martin Luther condemned it. Will Jesus literally reign for 1000 years on the earth? Is this time near? 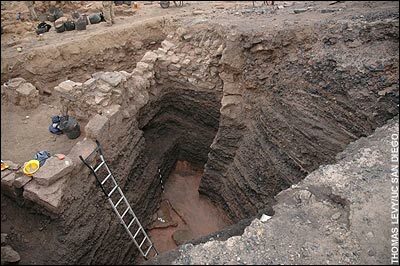 The excavation at Khirbat en-Nahas where scientists believe they may have uncovered King Solomon’s Mine. King Solomon, who assumed the throne of the kingdom of Israel after the death of his father King David, was renowned for his great wealth no less than for his great wisdom. But as always with the Bible, scholars have a field day arguing over the account’s historical accuracy. On one count, at least—the story of King Solomon’s mines—archaeologists think they have evidence that the story was more than a legend. An excavation led by Thomas Levy of the University of California, San Diego, and Mohammad Najjar of Jordan’s Friends of Archaeology has unearthed what they identify as an ancient center for copper production at Khirbat en-Nahas. Located in the lowlands of a desolate, arid region south of the Dead Sea in what was once the Kingdom of Edom, which the Old Testament describes as a foe of Israel, it is now the Faynan district of Jordan. As they are reporting in the Proceedings of the National Academy of Sciences, radiocarbon analysis dates the site as from the 10th century BCE, when David and Solomon would have ruled and about 300 years earlier than scholars thought. It is by no means certain that Solomon (or David) controlled the mines, but at least the dates now match. Solomon’s Temple This is a 5 minute animated film that shows one artist’s understanding of the details about Solomon’s temple. Two white supremacists allegedly plotted to go on a national killing spree, shooting and decapitating black people and ultimately targeting Democratic presidential candidate Barack Obama, federal authorities said Monday. In all, the two men whom officials described as neo-Nazi skinheads planned to kill 88 people — 14 by beheading, according to documents unsealed in U.S. District Court in Jackson, Tenn. The numbers 88 and 14 are symbolic in the white supremacist community. The spree, which initially targeted an unidentified predominantly African-American school, was to end with the two men driving toward Obama, “shooting at him from the windows,” the documents show. This is sad, but not unexpected. As regular readers of this page are aware, I have had concerns about whether Barack Obama or John McCain would eventually be killed (see John McCain Picks a Woman for VP). We do live in perilous times. 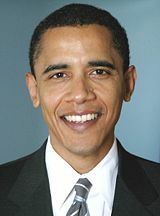 Barack Obama, Prophecy, and the Destruction of the United States Some claim that Barack Obama is the prophesied “son of Kenya”. Might Bible prophecy be fulfilled if he is elected president? Might Sarah Palin Fulfill Prophecy? Why might Sarah Palin fulfill Bible prophecy? Barack Obama is Not the Antichrist Some have suggested that he may be, but neither he nor John McCain will be. Find out why they cannot be. Two Horned Beast of Revelation and 666 This article explains how the LCG views this, and compares this to Ellen White. Neither John McCain nor Barack Obama are 666. Posted in Prophecy | Comments Off on Plot to Kill Obama! As most long term readers of the COGwriter page are aware, this website originally began as an AOL member site. And it was only on AOL until 2 1/2 years ago. AOL originally provided its members the ability to have a free webpage. We’re sorry to inform you that on Oct. 31, 2008, AOL® Hometown and FTP will be shut down permanently. We sincerely apologize for any inconvenience this may cause. Since there are still a few old pages there, at least 100-200 per month come to the current www.cogwriter.com website from the old AOL site. Beginning November 1, 2008, that will not be possible as AOL will no longer keep such sites. People should “bookmark” this page or the www.cogwriter.com website instead of first going to the old AOL pages as they simply will no longer exist. However, since I stopped providing updates at the AOL site some time ago, everything at www.cogwriter.com will still be available and unaffected by the AOL announcement. Those of you who do not come to this page from AOL will experience NO CHANGE. However, those of you who would like to receive regular updates via email for the news items on this page can sign up for this free service. This way you can automatically receive the news page items automatically (although they are only sent daily by this service). It only takes about 2 minutes to do it. Grotesque masks and costumes… terrifying images of movie monsters…sugar skulls and carved pumpkins…gravesite offerings for the dead. This year, millions of people around the world will observe Halloween,All Saints Day, All Souls Day and the Day of the Dead. Will you? Most people today know that the modern Halloween festival has its roots in ancient traditions that pre-date Jesus Christ—yet they have no qualms about taking part in a day that draws heavily on morbid pre-Christian superstitions. Why is this? What should it mean to Christians today? What did ancient Halloween celebrations involve? “The two chief characteristics of ancient Hallowe’en were the lighting of bonfires and the belief that of all nights in the year this is the one during which ghosts and witches are most likely to wander abroad… Further, it was a Druidic belief that on the eve of this festival Saman, lord of death, called together the wicked souls that within the past twelve months had been condemned to inhabit the bodies of animals” (“Halloween,” Encyclopaedia Britannica., 11th ed., vol. 12, pp. 857–8). “I don’t believe in all that mumbo-jumbo,” some might say. “I just like to have fun on a festival day.” Is there, in fact, anything wrong with the Halloween customs we see in modern-day America? Could there be any problem with costume parties, scary stories and the gathering of tasty treats? Should we disapprove of plastic battery-operated “goblins” glaring down at passing shoppers in a department store? After all, nobody today takes all the “scary” stuff seriously, right? Interestingly, some historians have suggested a link between ancient “Day of the Dead” practices and the destruction of Noah’s idolatrous and licentious generation. Noah’s Flood began in the “second month, the seventeenth day of the month” (Genesis 7:11). One year later, in the second month, on the twenty-seventh day, Noah exited the ark (Genesis 8:14–16). If we count the timing of Noah’s Flood according to the Jewish civil calendar, the seventeenth day of the second month would be somewhere from late October to early November. May God grant you the understanding and discernment to come out of the world, wholly follow Him, and reject the festivitals of death! The entire article is available on line and is titled Festivals of Death? Yet, millions upon millions around the world will celebrate Halloween and not the biblical holy days. You are currently browsing the Church of God News weblog archives for October, 2008.